Should You Buy a Tablet or an eReader? So you’re looking to buy a tablet or e-book reader, but need to understand the differences between them before you make a purchase. While these devices may look similar on the outside, they both have their own strengths and weaknesses. By the time you’re done reading here, you’ll have a solid understanding of which one will work best for you. Some popular tablets you may be familiar with are the Apple iPads, the Microsoft Surface Pro series, and the Samsung Galaxy. Apps & Games: Apps are available that allow you to easily expand the capabilities of your tablet. Movies, Music & Photos: Tablets have nice, big, colorful screens that are great for multimedia. Some tablets have powerful speakers perfect for pumping up your jam. Surfing the Web: You can browse the internet, check your Facebook, stay in touch with your friends and family. Reading: Colorful comics, magazines, and books with pictures look great on a tablet. Battery Life: The big, bright, colorful screen on a tablet eats up the battery quickly. Brightness: Staring at the bright screen of a tablet for long periods of time (especially while reading) puts a lot of strain on your eyes. Distractions: Notifications, messages, and alerts can sometimes be annoying on a tablet if you’re trying to stay focused. Screen Glare: The glossy finish on a tablet screen reflects light and it can sometimes interfere with what you’re doing. Some popular e-Book readers include the Amazon Kindle, Barnes and Noble Nook Glowlight, and the risible Kobo Glo. The best-in-class is the sublime (but expensive) Amazon Kindle Oasis. I have an Oasis and love it. Battery Life: Since e-Book readers don’t have big, colorful, flashy screens, you have 20-30 hours of reading time on a single charge. Focus: e-Book readers do one thing extremely well: focus on reading. Eye comfort: You can read from an e-Book for hours and it won’t strain your eyes as a tablet will. You can use it in direct sunlight, something that is not true for most tablets. Simplicity: The controls on an e-Book reader are usually simple and straight forward; just like reading a book. Browsing the internet: While some e-Book readers allow web access to download books, the simple screen will make web browsing near impossible. Multimedia: You can’t watch movies, look at color pictures nor listen to music from your e-Book reader. No colors: If you like reading magazines or comics, an e-Book reader may not be for you. No games or apps: When you buy an e-Book reader, you get what you get. There are usually no apps or games available to install. If you answered yes to question 1, that’s a point in favor of buying a tablet. ereaders tend to be locked to one provider. Personally, I don’t have a problem owning a Kindle – Amazon has every book imaginable. But it’s something to think about. With a tablet, you can get apps from different providers. Answering yes to question 2 is a point in favor of ereaders. If you answered yes to question 3, you might get some joy out of a tablet. Tablets are certainly flexible, while ereaders are only good for one thing. This table shows the technical specifications of each of the current range of Amazon Kindle eBooks. As you can see, the Kindle Oasis is the best one in almost every respect – it has amazing battery life, a better screen, and most importantly it is the lightest of the bunch. However, to get a premium product you pay a premium price. If money is no object it’s really a no-brainer. The other ones get progressively cheaper with progressively fewer features. Having said all that, there’s nothing wrong at all with the basic model. The first time I held one in my hands I was enchanted – I had no idea it would feel and look so good. If there are better models out, so much the better. Visit the official Kindle page here to check the latest information and prices. 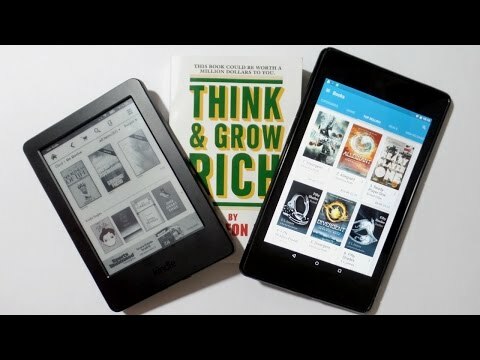 While tablets are basically mini, portable computers that can do a whole lot, e-Book readers focus on reading and they make that experience much more comfortable than a tablet can.